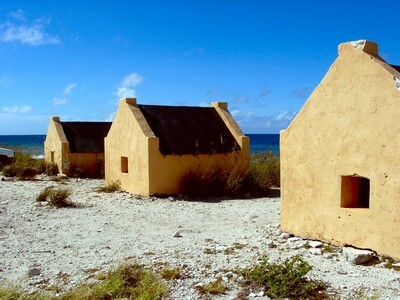 Bonaire is a small, boomerang-shaped island located just off the Venezuelan coast in the Southern Caribbean. 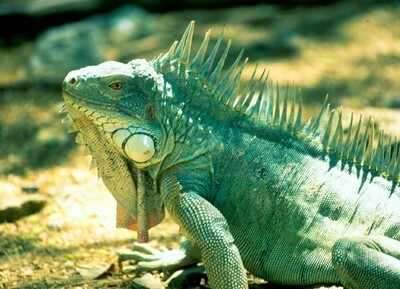 It is part of the group of islands known as the Netherlands Antilles, as is sister island Curacao, just 40 miles away. 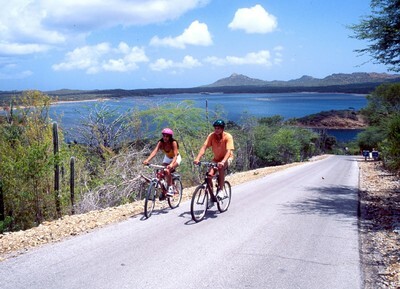 Bonaire enjoys a typical Caribbean lifestyle…laid-back, slow-paced, and thoroughly relaxing. Bonaire boasts over 80 dive sites, many of which are easily accessible by shore….which explains why it is consistently ranked one of the top diving destinations in the world, one of the top snorkeling destinations in the world, and the “shore diving capital” of the world. The waters surrounding Bonaire are designated as an official marine park, and thus offer the most pristine reef diving in the Caribbean. Expect hard coral formations, dense soft coral stands, colorful sponges, and an incredible diversity of reef inhabitants including tangs, damsel fish, butterfly fish, angel fish, lizard fish, scorpionfish, sergeant majors, and more. You’ll also spot schooling pelagics such as snapper and jack. Because the Southern Caribbean enjoys an arid climate with little rainfall, water temperatures range from 78-84 degrees and visibility ranges from 100-150 ft! 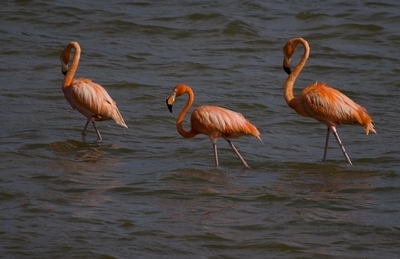 Conservation has long been an issue of importance to the people of Bonaire. 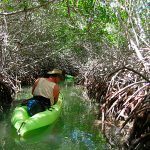 The result is an abundance of eco-adventures both above and below the water. 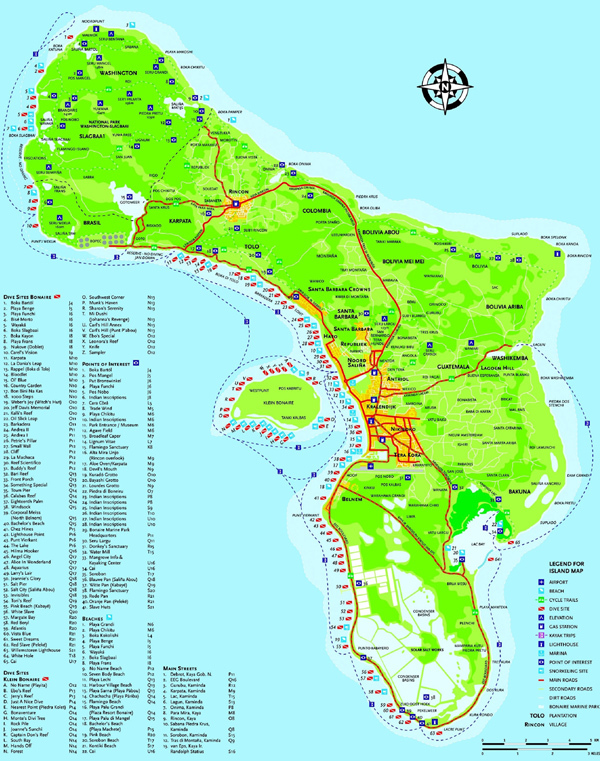 The topography of the island includes three distinct regions that each offer unique opportunities for exploration and adventure. Be sure to include a few in your itinerary. 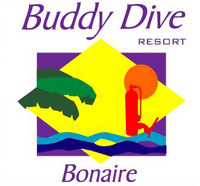 Explore Bonaire’s 60 dive sites, as well as the 20 dive sites around Klein Bonaire, with Buddy Dive Resort. 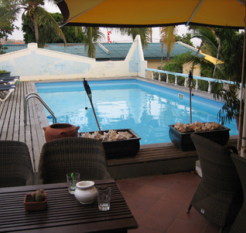 The resort is a PADI 5 Star Gold Palm Resort, a DAN Member, and a Universal Referral Center. A fleet of 5 dive boats depart daily for morning, afternoon, and evening dive trips. Boats range from 30′ to 42′ and can accommodate from 10 to 27 divers respectively. 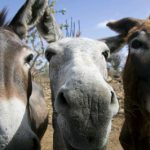 All are equipped with first aid kits, oxygen, two-way radios, and rescue equipment, as well as camera rinse tanks, dry storage, freshwater showers, plenty of cold drinking water, and fresh fruit. Buddy’s dive shop includes a complete rental and retail center, exceptional staff, and a unique “Drive Thru” air & Nitrox fill station. Additional amenities include a full range of courses & certifications, a digital photo center, a gear room, rinse tanks, and a classroom. Tech Diving is also available. Divers of every level will enjoy the 100′ vis, 80 degree water, and minimal currents that Bonaire has to offer. Buddy Dive Resort even boasts a very popular house reef to explore. Does it get any easier or more enjoyable than this? The dive operation at Captain Don’s Habitat is an SDI/TDI Professional Development Center. Scubapro & Uwatec equipment, as well as those last minute items you may have forgotten, are available for rent or sale in the Captain’s Locker. A full line of technical diving equipment, including Drager Dolphin rebreathers, is also available. Photo services, including a full selection of the latest in photo and video equipment for rent or sale, personalized instruction and private photo shoots are offered. In fact, the Caribbean base for the Nikon School of Underwater Photography is located at Captain Don’s Habitat. In addition to lockers (above) and a private dock (left), Captain Don’s Habitat offers a divers-only “baby dock”, placing divers a giant stride away from clusters of starlet coral, colorful wrasses, gobies, and a drop-off just a few kicks further. Shore diving is available 24 hours a day. Custom built dive boats depart for three single-tank trips daily. Over 50 world-class dive sites are within a 15 minute boat ride away. Not only that, each mooring buoy is limited to 1 boat so you’ll have the reef all to yourself. The Habitat dive operation is equipped to handle all of your training and certification needs including courses in the use of rebreathers and Tri-Mix. Rec Tek Scuba is also conveniently based out of the resort with it’s own tech diving dedicated classroom. 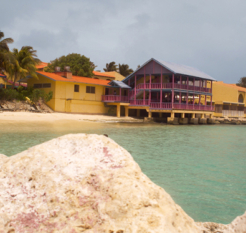 Divi Flamingo Beach Resort offers guests an amazing underwater adventure with Divi Dive Bonaire, a PADI five-star dive center located on the property. Divi Dive Bonaire is the island’s oldest and best known dive operator, operating what many call the most convenient dive experience in Bonaire. With the Calabas Reef just 20 yards in front of the hotel and 24 hour access to tanks, diving with Divi is the easiest dive vacation you will ever take. Divi Dive Bonaire provides guest gear storage, a fully equipped dive shop and an experienced dive crew with over ten years experience diving in Bonaire. Morning, afternoon & night boat dives are available to guests, and tanks for shore diving are available 24 hrs a day on the dock. Tanks are also ready for pickup at the tank station in the parking lot, making off-property shore diving exceptionally easy…just pull up to the station, load some tanks into your rental truck and head up the road to your first dive site. Divi Dive Bonaire offers a variety of dive services, ranging from shore diving to all day 3-tank boat trips. Typical dive days consist of morning 2-tank trips and afternoon single-tank trips. Night diving is available every night from the dock, and a night boat is scheduled upon request. All five 36-42 ft custom dive boats feature lots of shade, iced water & fresh fruit, large camera tables, freshwater camera rinse buckets, wide swim platforms, twin ladders and more. Divi Dive Bonaire offers a full range of certification courses. Tech diving is also available. 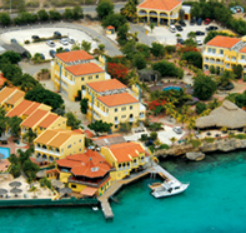 This PADI 5 Star Gold Palm IDC Center is conveniently located at Plaza Resort Bonaire. Four spacious boats depart for single and two tank dive trips daily. Boats are fully equipped with all safety features, towels, and ice water. Two tank dive trips will include fresh fruit and juice. You’ll find equipment rinse tanks, showers, and lockers next to the dock. Rental gear is well maintained and includes rebreathers and tech gear. A well stocked retail dive shop is also available on-site. Tanks are available 24 hours a day in 3 different locations at the resort. Just grab one and walk into the water. 18 Palms, an official marine park dive site, just happens to be the house reef! Additional amenities include an air-conditioned classroom with up-to-date teaching aids, a full range of instruction & certifications, custom underwater videos, a fun AQUAKIDS program, and availability of Nitrox & Trimix. 64 steps lead down to this dive site, but on the way back up, weighed down with your gear, it feels more like 1000! The site features a shallow terrace that quickly drops off. The highlight here is a number of pagoda-shaped star coral formations housing numerous creatures within their hollow cores. Look for male sergeant majors protecting their eggs, queen angelfish, green morays, octopus, schools of snapper, hawksbill turtles, and even mantas. All in all, your experience will be well worth the effort! Buddy Dive Resort’s house reef is located about 30 feet from the dock. You’ll see hard corals, black crinoids, gorgonians, seahorses, frogfish, and more. Great night dive. Diving this interesting site requires permission from the Cargill Salt Company. (Your dive operator will make the necessary arrangements.) The pillars are encrusted with sponges and coral, and there is plenty of marine life to enjoy. Look for large barracuda and tarpon, frogfish, eels, octopus, scorpionfish, lizardfish, squid, spotted drums, parrotfish, and more. This a great dive to do late in the afternoon, as the sun casts some amazing shadows. 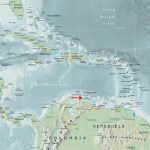 This site is among the top, if not the top dive for fish diversity in the Caribbean. Over 350 species have been sighted here including frogfish, jawfish, blennies, creole wrasses, queen angelfish, french angelfish, grouper, stoplight parrotfish, blue tang, butterflyfish, yellow goatfish, grunts, trumpetfish, sergeant majors, soldierfish, damselfish, scorpionfish, brown chromis, flounder, and many more. This popular stretch of reef is only accessible as a boat dive, but is also a great snorkeling spot. Putting in an appearance amid the hard corals will be seahorses, turtles, french angels, morays, sergeant majors, christmas tree worms, and more. This sand and coral rubble site boasts a great diversity of marine life. Sand divers, rays, garden eels, frogfish, french angels, hawksbill turtles, porcupinefish, surgeonfish, flounder, spotted cleaner shrimp, scorpionfish, grouper, trumpetfish, and jawfish are but a few of the creatures you’ll see here. Beautiful hard and soft corals attract turtles and some larger pelagics. Look for jacks, margates, brown chromis, snapper, barracuda, and wrasses, as well as flounder, sergeant majors, grunts, stoplight parrotfish, filefish, and goatfish. Belmar Oceanfront Apartments offers 22 luxury oceanfront condos set amid lush tropical gardens at the ocean’s edge. The spacious condos feature one, two or three bedrooms with one or two bathrooms, fully equipped kitchens and large living areas. Every one of the private balconies/porches provides a fantastic ocean view. All bedrooms are air-conditioned while the living rooms and porches have ceiling fans. All apartments feature a music-center, cable TV, telephone, safe and fully equipped kitchen with fridge, dishwasher, microwave, coffee maker, toaster and more. 8 Classic Superior apartments offer a master bedroom with king size bed (left) and master bathroom with tub, a second bedroom with 2 single beds (below), 2nd bathroom with shower, and a large covered terrace with rotan furniture. These units are located on the ground floor. 2 Grand Deluxe (2 bdrm) apartments are located on each corner of the ground floor. These units offer all the amenities of a Classic Superior apartment with a bit more living space. 4 Suite Deluxe apartments are located on the second floor and feature 1 bedroom with a king size bed, 1 bathroom with tub and a large covered balcony with rotan furniture. 4 Grand Deluxe (3 bdrm) apartments are located on the second floor. These apartments feature a master bedroom, master bathroom and large covered balcony on the main level, and 2 additional bedrooms with 2 single beds each, as well as a 2nd bathroom with tub located upstairs. Also located on the second floor are 2 VIP Deluxe apartments. These units offer all the amenities of a Grand Deluxe (3 bdrm) with a bit more living space and a queen bed instead of 2 singles in one of the bedrooms. On the third floor are 2 Penthouse Deluxe apartments, one with a Jacuzzi, one without. Both have a unique “open” living/kitchen area with 6 ceiling fans, double covered balcony and cooking island with electric stove and microwave in the center. These units are 2 bdrm/2 bath. The master bedroom has a king bed, the 2nd bedroom has a queen. Buddy Dive Resort is known for its casual atmosphere, personable staff, spacious accommodations, and spectacular dive center. Eleven modern buildings house one, two, and three-bedroom apartments, hotel rooms, and studios. Each offers either an ocean or garden view and a private balcony or patio. This cozy, friendly, and fun resort is perfect for divers, snorkelers, and adventurers, as well as leisure travelers. So dive to your heart’s content, take part in a myriad of other activities, or just sit back, relax, and enjoy the turquoise waters, warm gentle breezes, and spectacular sunsets. Each apartment features a fully equipped kitchen with microwave, stove, and refrigerator, a comfortably furnished living area with cable TV & phone, air-conditioned bedroom(s) with twin, queen, or king bed(s), and a bathroom with shower for every bedroom. Studios offer a small kitchen, a separate bedroom with a/c, and a bath with shower. They also feature cable TV, telephone, and a small patio. The air-conditioned hotel rooms are equipped with a table-size fridge, cable TV, telephone, bathroom with shower, and a balcony. All levels of accommodation feature in-room safes. Captain Don’s Habitat was founded in Bonaire in 1976 by the renowned marine enthusiast & environmentalist Captain Don Stewart. His vision of environmentally sound practices is reflected in the design of the resort. From the low impact construction methods, to the use of solar water heaters and energy saving devices, to the state of the art wastewater treatment system, every detail has been designed to have the lowest possible impact on the environment. Even the rooms and facilities are nestled in lush landscaping that has been carefully designed to eliminate harmful runoff into the fragile marine ecosystem thriving right in front of the resort. 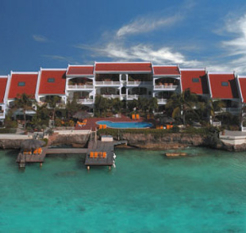 24 Deluxe Ocean View rooms (left) feature lovely views of the pool and the Caribbean Sea. Each room offers a/c, 2 queen beds, desk, cable TV, refrigerator, coffee maker, hair dryer, laptop safe, full bath w/tub, telephone, wifi internet access and a secluded balcony or patio with comfortable furniture. 11 Villa Ocean View rooms (right) feature a/c and either 2 single beds or 1 double bed. Each room is furnished with a dresser, mirror, chair, small refrigerator, cable TV and bathroom with shower. Some have a balcony with patio furniture. 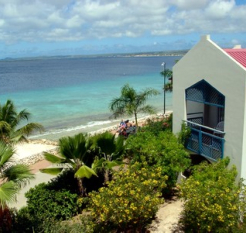 All are on the upper floor of the 2-story Ocean Front Villas, and all provide an excellent view of the ocean and Klein Bonaire. The first floors of the villas are configured into 4 one-bedroom Villa Suites and 1 Villa Studio, all with full kitchens. Entire Villas can be rented on a by-request basis. Also available are 16 Two Bed/Two Bath Bungalows with tropical furniture in the air conditioned living room, fully equipped kitchen, in-room telephones, cable TV and large covered patio area, as well as 3 Two Bed/Two Bath Apartments tucked back into the gardens with full air-conditioning, a spacious dining/living room and full kitchen. Dining options include Rum Runners (left), offering an international menu and daily local specials for breakfast, lunch and dinner, and Pizza Temple, serving delicious authentic thin-crust pizza baked in a traditional stone oven. Pizza Temple is open from 3:00pm to 10:00pm. The Deco Stop Bar (below) offers a daily happy hour and live entertainment twice a week. 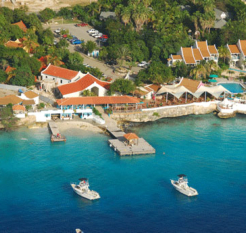 Located north of town at the foot of Bonaire’s hills and just steps away from the most pristine dive sites, you’ll find Caribbean Club Bonaire. This cozy 34-unit resort combines affordable accommodations with full resort facilities like a restaurant, bar, swimming pools, on-premises dive shop, and 24 hour front office and security services. Guests have a choice of accommodations ranging from basic studios to luxurious two-bedroom cottages overlooking the crystal blue waters of the Caribbean Sea, as well as a wide range of options in between. All units have air-conditioned bedrooms while the living rooms and porches feature ceiling fans. The 17 One-Bedroom Cottages and 4 Studios feature a kitchenette with all the equipment and utensils you need to prepare a good meal, a queen or 2 twin beds, separate living area (One-Bedroom Cottages only), separate bathroom, large porch with furnishings, cable TV and safe. Two-Bedroom Cottages offer a full kitchen, two bedrooms, one or two bathrooms, cable TV & safe. The 3 Two-Bedroom Standard Cottages are located near the entrance of the resort. These units feature one bathroom and enjoy tranquil hillside views from their large porches. 7 Two-Bedroom Deluxe Cottages are situated around a relaxing pool and sun deck area (bottom photo). These units feature stunning views of the Caribbean. Each bedroom enjoys access to the private balcony and has its own bathroom. Located near the Two-Bedroom Deluxe Cottages is a Honeymoon Cottage with large deck, indoor Jacuzzi and double shower. 2 Penthouse Suites are located on the second level of the building pictured left. These private units feature a huge porch with amazing ocean views, large bedroom with queen size bed, air-conditioned living room with possibility for extra double bed, full kitchen, cable TV and safe. Penthouse 101 has 2 bathrooms. The 4 Studios are located on the ground floor. 2 enjoy hillside views, while the other two face the sea. For bigger parties, connecting doors can be opened between Studios and Penthouses. Den Laman is the perfect reminder that good things DO come in small packages! This waterfront property may be small, but it still delivers “large property services” with a highly personal touch. The property features a total of 16 fully air-conditioned units including 4 Studios, 5 One-Bedroom Units, 2 Two-Bedroom Oceanview Units, 4 Two-Bedroom Oceanfront Units & 1 Two-Bedroom Oceanside Deluxe Unit. The One-Bedroom Units are Ocean-view or Oceanfront with one queen bed in the separate bedroom. The Two-Bedroom Oceanview Units have one queen bed per bedroom, while the Two-Bedroom Oceanfront Units have 2 twin beds or 1 king in the 2nd bedroom. The Two-Bedroom Deluxe Oceanside Unit, the only one located on the ground floor, has a walk out porch with additional dining space and a private terrace overlooking the ocean and dive dock. All units have a high-end kitchen, dining area, living area with LCD-TV, surround sound system & DVD player, and a private balcony. The condominiums are perched atop Sunset Bar & Grill, which is open daily excluding Wednesdays from 11am to 2:30pm for lunch and 5pm to 10pm for dinner. The restaurant offers guests superb meals in a relaxed atmosphere with stunning vistas of the Caribbean Sea. Divi Flamingo Beach Resort is a colorful, unpretentious 3 star resort with perhaps the best location on the island. The Calabas reef starts just 20 yards from shore, making shore diving easy and convenient. The resort offers 129 casual guestrooms & studios. Just beyond the northern border of the resort are 3 excellent restaurants, as well as the start of the waterfront promenade that leads you into the heart of town. The standard guestrooms (left) offer tropical garden views, and are located either in a two story hotel block or in casual-style villas with private patios. Each standard room includes one or two double beds, air-conditioning, fridge, coffee maker, television and in-room safe. The deluxe guestrooms (right) are oceanfront, offering full ocean views with private balconies. Every deluxe room includes two double beds, air-conditioning, fridge, coffee maker, television and in-room safe. The studio units are located in a charming sky blue gingerbread-style complex with a private pool. These units offer guests two double beds with a queen sleeper sofa, fully equipped kitchen with refrigerator and coffee maker, a/c, television and spacious screened porch. All studio units offer pool views. Chibi Chibi Restaurant (right) extends out over the water and serves inventive lunches & gourmet dinners while guests soak up stunning ocean views. Buffet-style breakfast is served in the open air, oceanfront Calabas restaurant (below). 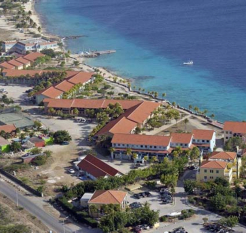 Plaza Resort Bonaire is situated on a peninsula at the mouth of a lagoon, less than 5 minutes from Flamingo International Airport. The resort is bordered on one side by a beautiful white sand beach, and the grounds of the resort are loaded with tropical plants and trees…a perfectly tranquil atmosphere for the leisure traveler. For the more active traveler, a plethora of activites and excursions are yours to enjoy…Plaza Resort Bonaire truly has it all! Levels of accommodation include Standard Suites, Grand Suites (right), and One & Two Bedroom Villas. All feature air-conditioning and either a balcony or a patio. Standard Suites (left) offer lagoon, marina, or ocean views, two queen size beds, cable TV, telephone, in room safe, sitting area, electric kettle, mini fridge, Italian tiled floor, and a large bathroom with shower and hair dryer. The Grand Suites are even more spacious and boast gorgeous ocean views. The One Bedroom Villas feature lagoon views, fully equipped kitchens, and separate bedrooms with two queen size beds. The Two Bedroom Villas have one larger bedroom with either two queens or a king, a smaller bedroom with two single beds, and two bathrooms. Restaurants include Caribbean Point for breakfast, the Banana Tree for lunch & dinner, and the Tipsy Seagull (right) for a romantic dinner on the sand. Grab your favorite cocktail at Coconut Crash Beach Bar (below), open from 11am on. 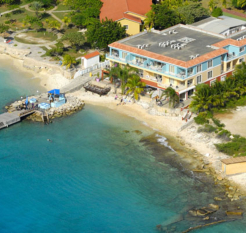 Sand Dollar is located 2 miles north of downtown Kralendijk, next to Den Laman Condominiums and Bonaire Dive & Adventure. The property offers spacious and comfortable studio, one, two and three bedroom condos. Every condo has its own private porch or balcony facing the ocean, with a layout designed to capture the flow of the naturally cooling trade winds. All bedrooms are air-conditioned. Studios feature a queen size bed, full bathroom, fully equipped kitchen with breakfast bar and spacious living & dining areas. Most of the Studios are located on the ground level or 1st floor. The One Bedroom Condominiums feature a bedroom with queen size bed, separate spacious living room, full bathroom and fully equipped kitchen with breakfast bar & dining area. One Bedrooms are available on the ground level and 2nd floor. The Two Bedroom Condominiums feature a master bedroom with king size bed, a 2nd bedroom with two twins, 2 full bathrooms, fully equipped kitchen with breakast bar & dining area and a spacious living room. Choose from a single level layout or a two-level townhouse layout. The Three Bedroom Condominiums feature a master bedroom with king size bed, a 2nd bedroom with queen size bed, a 3rd bedroom with two twins, 3 full bathrooms, fully equipped kitchen with breakfast bar & dining area and a spacious living room. Enjoy fine dining in a casual, oceanside atmosphere. Fresh seafood and juicy steaks are the specialties, and happy hour begins at 5:00pm. Closed on Mondays. Located near Divi Flamingo Beach Resort. This charming restaurant features deliciously authentic Italian cuisine. Choose from fresh pizza, homemade pasta, or one of the daily specials…any dish featuring lobster is amazing! Closed in September. Located just north of Divi Flamingo Beach Resort. For tapas and tasty International cuisine, head for this historical building overlooking Klein Bonaire. Make a meal out of a combination of tapas or try one of the main courses. Great wine list! Open for lunch and dinner. The French European cuisine at this elegant, oceanside restaurant is not to be missed! Excellent service. Open 5:00 pm to 10:00 pm. Closed on Tuesdays. Reservations recommended. Located just north of Divi Flamingo Beach Resort. Go snorkeling….most dive sites are accessible from shore, making this a snorkelers paradise! 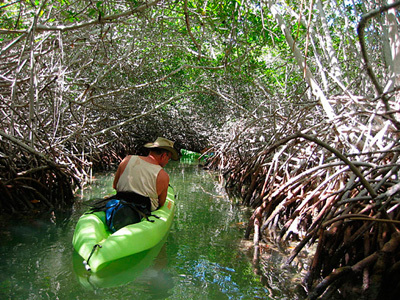 Kayak through the mangrove forest. 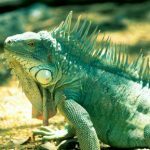 Learn about the natural flora and fauna of Bonaire with a visit to Washington Slagbaai National Park. 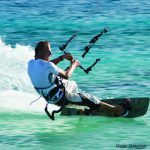 Try kiteboarding, Bonaire’s newest wind sport! Enjoy striking inland views with a bike ride to Goto Lake. Climb down (and back up) the limestone stairway at 1,000 Steps…the view is well worth the effort. 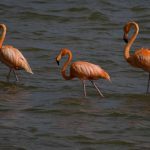 Observe flamingos in their natural habitat at the salt pans of Pekelmeer. 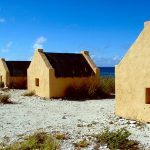 Learn about Bonaire’s past as you tour historical sites. 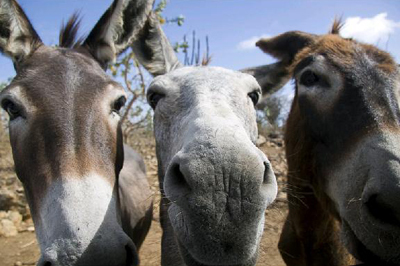 Visit Donkey Sanctuary Bonaire, which has been rehabilitating sick, wounded, and orphaned donkeys since 1993. Non-stop flights from Newark take approximately 5 hours, 45 minutes. Non-stop flights from Houston take about the same amount of time. Total flight time will obviously depend on your departure city and connecting flights. Bonaire, along with the rest of the Netherlands Antilles, uses the Netherlands Antillean Florin (NAFl), which is also known as the guilder. Just as in the US, change valued below 1 guilder is in cents. You’ll encounter 1 cent, 5 cent, 10 cent, 25 cent, 1 guilder, and 5 guilder coins, as well as paper money in 10 guilder, 25 guilder, 50 guilder, and 100 guilder denominations. The exchange rate is approximately NAFl 1.75 to US $1. 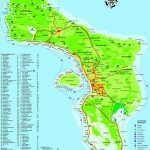 Credit cards are widely accepted, and there are about a dozen fee-free ATMs around the island that dispense money in either guilders or US dollars. The official languages are Dutch, Papiamentu, and English. Spanish is also widely spoken. 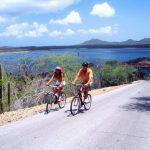 Yes, you will need a valid passport to enter Bonaire, as well as to re-enter the US. Visitors to the Netherlands Antilles may be asked to show onward/return tickets or proof of sufficient funds for their stay. Length of stay is granted for two weeks and may be extended for up to 90 days by the head office of immigration. Always check www.travel.state.gov before traveling for the most current information. 127 V, 50 Hz. US appliances tend to work, but may run hotter. Some resorts are equipped with 220 V outlets. We always recommend carrying your own universal converter. 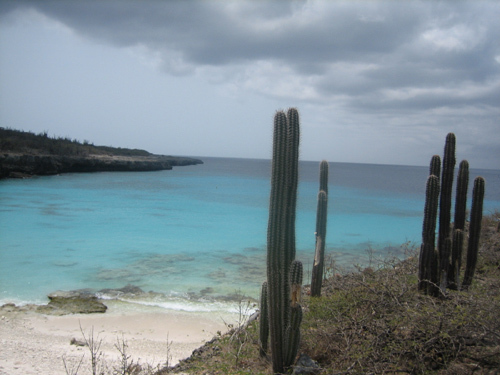 Bonaire is the “shore diving capital” of the world. The waters surrounding Bonaire are designated as an official marine park, and thus offer the most pristine reef diving in the Caribbean. Expect hard coral formations, dense soft coral stands, colorful sponges, and an incredible diversity of reef inhabitants including tangs, damsel fish, butterfly fish, angel fish, lizard fish, scorpionfish, sergeant majors, and more. You’ll also spot schooling pelagics such as snapper and jack. Because the Southern Caribbean enjoys an arid climate with little rainfall, water temperatures range from 78-84 degrees and visibility ranges from 100-150 ft! Most dive operators offer either a one-tank or two-tank morning dive, followed by an afternoon dive. Night dives are typically scheduled once or twice a week.